The Multi Flow System is basically an ebb & flow type hydroponic system that uses gravity as its major source of moving water through the system. The brains of this system is a controller unit assembly which consists of a 3.5 gallon container, with a timer and relay box mounted on the side, and float switches mounted inside of it to control the level of water in the system automatically. Each timer pin on the controller has a duration of 15 minutes which allows for better control over watering cycles. Each pin pushed down on the timer will water the system for 15 minutes. This is an advantage over most 30 minute increment timers because the plants really only need to be watered to the point the roots are saturated and then the water should be drained out. Also, because this system is an ebb & flow system, as the water is drained out it actually pulls oxygen down to the roots. "So how does this system actually work," you ask? Well its actually very simple. First of all you must layout all of the pots and set them up on a level surface. Then connect the pots together using various fittings and tubing (included). Once you have done this you plug the power cord of the pump in the reservoir into the controller unit and set your watering times. When the timer reaches the watering time you have selected, the pump turns on inside the reservoir pumping nutrient solution into the controller unit. This will continue pumping into the controller while gravity is then pushing the water out to the other pots. Once the desired watering level is reached the float switches will then cut the power to the pump in the reservoir. As long as the timer is on the system will maintain this watering level. Once the timer turns off, the pump inside the controller is engaged and the nutrient solution is then pumped back into the reservoir. This will continue until the water level reaches the preset drain depth then the pump will be turned off. Since the pumps are only pumping a short distance, to and from the reservoir, wear and tear is greatly reduced and will ensure that your pumps last for a long time. 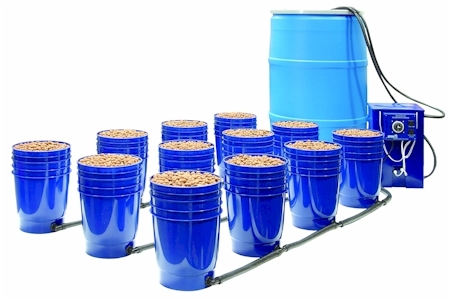 The two gallon pots used in the Multi Flow allow your plants to grow strong and tall while giving them a spacious container to produce a large root structure. The two gallon growing containers actually sit inside of other two gallon pots which serve as the watering cells. So, all the growing containers can be pulled out and moved around according to plant growth. You are not stuck trying to re-layout the system and cut new tubing or relocate a bunch of drippers, all you do is pull the plant and growing container out and move it to a new location. It couldn't be any easier to move your smaller plants directly under the lights and move your larger plants out to the perimeter of the room to promote uniform growth throughout the grow room. "Versatility" is the key word when describing the Multi Flow. It is easily expanded to a system consisting of up to 48 pots available with the 6 add on pot expansion. These dimensions will help give you an idea of how large of a system you can fit into your grow room. The measurements will tell you how large all the parts are so you can lay your room out on paper first.